You may have heard by now that the eighties boy band sensation, New Kids On The Block are reuniting and touring this year along with Back Street Boys. I am the right age to remember them, so I was glad to get a chance for a little Q and A session with them. I was taken aback to learn that at the eleventh hour, they have decided to change their name. Colleen Smith: Hi guys! I was a fan back in the day, and still have your posters and records at my parents' house. I can't wait to hear more about what you are up to now. Donnie Wahlberg: Thank you, Colleen. It has been about 20 years since we hit it big, and people who remember it are looking back, feeling nostalgia, and wanting to see us again. We are happy to oblige them. We love our old fans! Colleen Smith: Donnie, I guess you will have to take a break from playing Danny Reagan on Bluebloods to do this, Does that bother you? Donnie Wahlberg: It is not a problem, The way the show is produced, I can do both. There is really no reason to take a break. Colleen Smith: Not only are there women in our thirties and forties who love New Kids, I think a whole new generation will take to you. Jordan Knight: I don't know about that. Danny Wood: Kids today are crude, rude and disrespectful. It wasn't like that back in my day! What is it with these kids. It seems like every other word out of their mouth is a dirty one. Their mothers ought to wash out their mouths with soap. Jonathan Knight: These kids today are different! All they listen to is that hippity hoppity. In my day, there was singing! I don't think they like actual singing much. The music today is just no good as far as I am concerned. Nothing worth a damn has come out since the late '90s. That is why we are making some changes this time around. Colleen Smith: Changes? What will you be doing differently? Donnie Wahlberg: First and Foremost, we are taking a direction we feel is appropriate for our ages. Joey McIntyre is the only one of us still under 40, and he just barely is. Donnie Walhlberg: Our producers weren't happy to hear this at first, but have agreed to it. All the posters for the marquees and everything else will have to change. 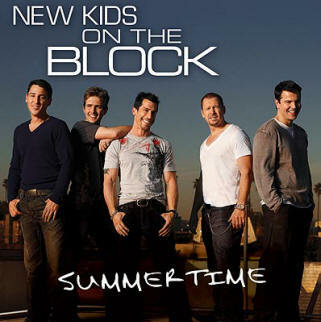 To attract only our older fans whom we still adore, and no little brats, New Kids On The Block will now be known as Damn Kids Off My Lawn.